Thousands of families have described Teach Them Diligently as the highlight of their year! If you have never been to a homeschool convention, we invite you to experience Teach Them Diligently as your first. You'll be glad you did! Homeschooling is not simply an academic exercise. It is about discipleship and raising the next generation of believers. If you are a Christian homeschooling in Colorado or the surrounding areas, this is an event you do not want to miss! Be encouraged! Strengthen your faith under the ministry of some of today’s most incredible Christian speakers! 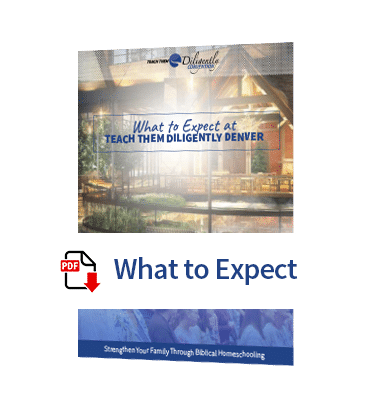 If you are considering homeschooling, but have questions, feel like you can’t do it, or just want to know what the options are, then please accept my invitation to come and find those answers at one of our great homeschool conventions. And if you are already homeschooling, then you know just how needful events like these are. I look forward to seeing you this spring. of your family through special programming designed with each one in mind! We are thrilled to be coming to Colorado for the first time! Last year tens of thousands of people attended Teach Them Diligently Conventions across the U.S. and we’re already looking at great turnout in Denver this year! Are You Ready To Rethink Education?